Southeast Texas Senior Marketing Calendar – Spend quality time with local senior citizens at the Southeast Texas Senior Expo in Port Arthur. The event is a Senior Lifestyle Expo featuring educational seminars, entertainment, and activities for Southeast Texas senior citizens 55+. All Southeast Texas and East Texas senior service providers are welcome (we are working to limit competing vendors, so some categories may be full – schedule your spaced today). One of the challenges SETX seniors face is finding all of the information they need (or want!) in one place. The Southeast Texas Senior Expo – Port Arthur has been designed to address the issue by bringing a wide range of senior service experts under one roof. There will also be seminars, entertainment, and the event will conclude with an hour of Bingo featuring great prizes. Do you have questions about this Southeast Texas senior event? Stay tuned for upcoming editions of the Southeast Texas Senior Marketing Calendar. 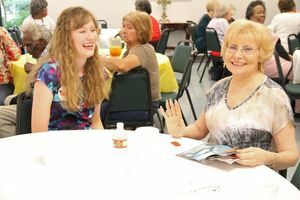 You can also find great Southeast Texas senior events, news, and resources on SETXSeniors.com. They publish over 400 local articles every year for the Golden Triangle senior community.